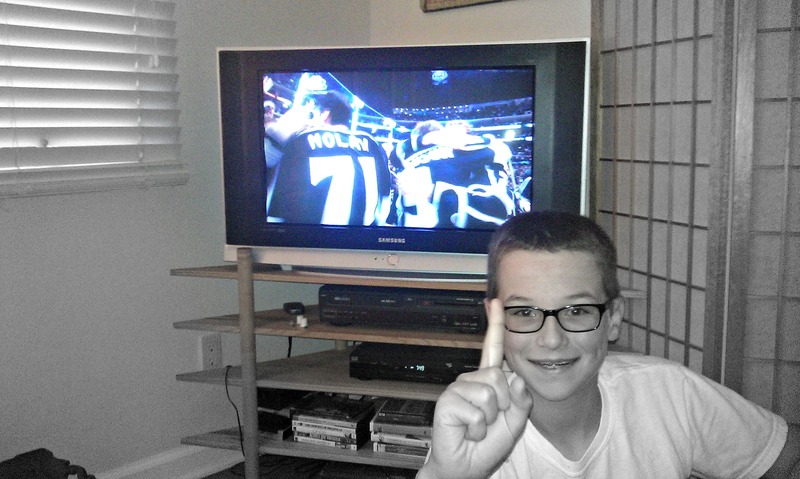 Twitter Chats: How to survive and thrive in a Twitter Chat… hockey style eh? 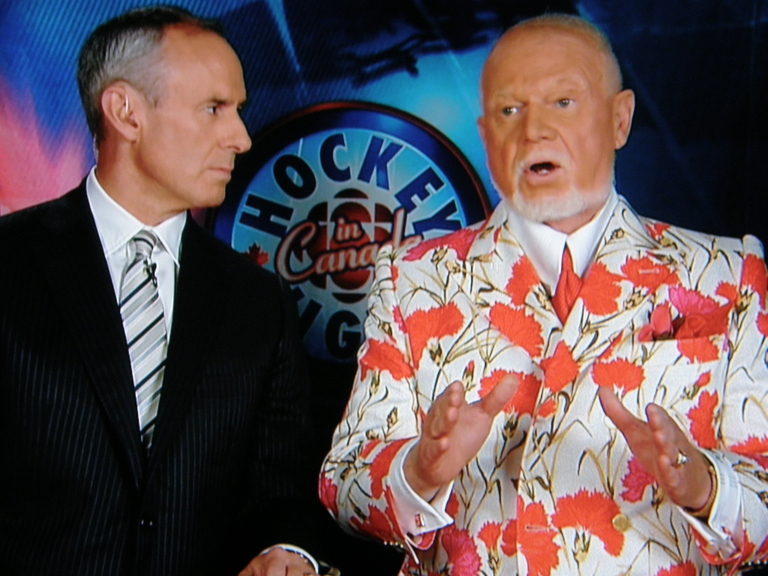 15 Comments on Twitter Chats: How to survive and thrive in a Twitter Chat… hockey style eh? *crucial update 1/11/14 see below and I also included a 1/12/14 update with how to get RID of SPAM! So you’ve never done a Twitter chat eh? Twitter chats are pretty crazy. You want to know how crazy. 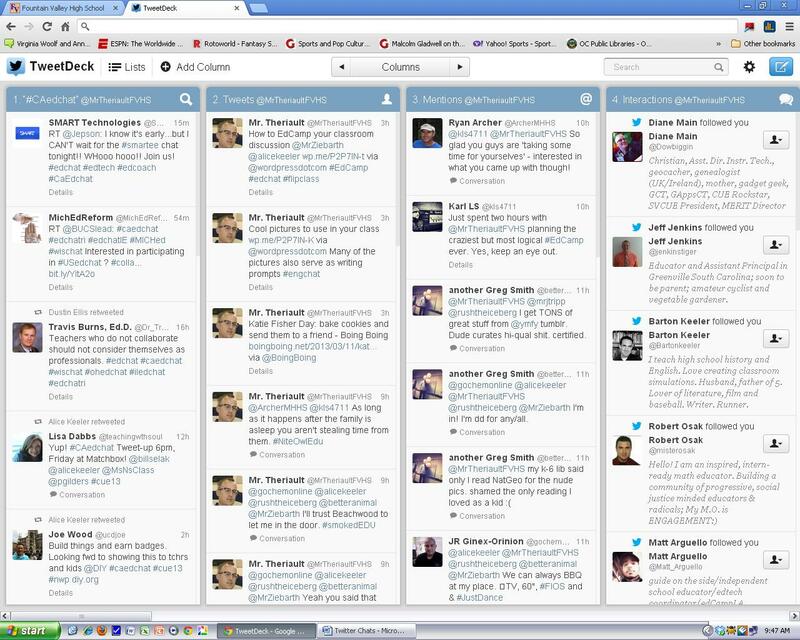 Well here’s a visual example of what a #satchat looks like on my computer screen every Saturday morning. Okay that’s crazy right? There’s no way you can watch it all at once. It’s impossible. But something incredible happened you just need some tips and techniques to get the most of your experience- cause believe you me a Twitter Chat is the hockey equivalent of double-overtime playoff hockey. Intense beyond belief, but in that one hour you will get more great ideas than in an entire day of professional development at your school. 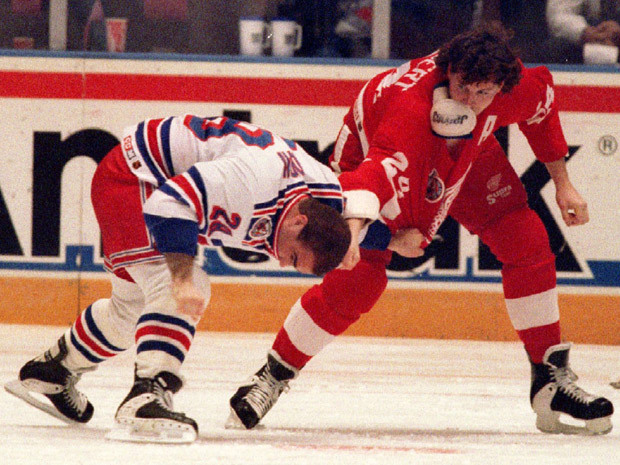 Whenever someone tells me they don’t like hockey- I ask them have you ever been to a game? 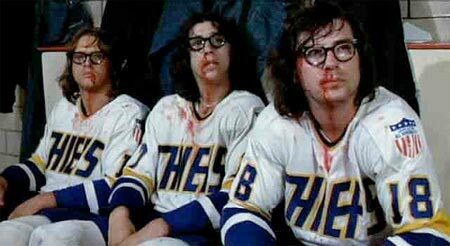 I mean even before the puck drops the tension is palpable. They are focused around a specific topic: I’ve done Twitter chats on building community in the classroom, the best way to attend conferences, how to start the school year and even the best way to get hired. They are happening all the time. I’ve joined Twitter chats from other states and even other countries at all hours of the day and night. If you make an insightful or useful Tweet, you will usually pick up more followers during a chat then just skating around Twitter all day. You will find more people to follow during one Twitter chat than you would during a week of Twitter. If someone is being Re-Tweeted (RT) during the chat then their voice resonates with others or they are a Twitter big wig and people love RTing their ideas. People are obsessed with people who make an impact on others no matter how big or small they are. You are gonna need the right tools, I prefer waxed laces and a hockey stick without a lot of curve, and that starts with a chat client like TweetDeck. TweetDeck is free- I use Google Chrome and you can get TweetDeck on the Chrome store. Here’s what it looks like. So first you are going to have to find a Twitter Chat. The best place to find one is run by Jerry Blumengarten which can be found here: http://cybraryman.com/chats.html You should browse around his site he has a ton of useful educational information. Once you find one you load your sign-in to your TweetDeck program. Then locate the “add a column” button and add the following columns. Mentions: You can see who is talking to you and you can have a side conversation with them during the chat. This is difficult to do and you WILL lose track of the chat, but perhaps they said something that is so important they you want to make a connection right away. Then you will need to move the hashtag twitter chat that you chose to the far left because that’s going to be the most important column during the chat. You move it by clicking on the “Columns” section on the top then hover your mouse over the weird double bumps symbol on the left side of the column and then you can move each column up or down. SUPER IMPORTANT: If you do not include the #hashtag being used in the specific Twitter chat (for example we use #CAedchat in our Sunday night California Educators chat) then NO ONE in the chat will see your tweet. This happens all the time, so don’t forget it- some programs and sites will remember it for you, or you can copy it and then just hit control-V and paste it into the end of each tweet. If you hover your mouse over the right side of each Tweet you will see some important buttons you can click. Reply: If you have a follow-up question or a comment on a specific post during the chat you can send a Tweet directly to their Twitter account. If you take the time to reply you will miss some of the Twitter chat feed, but the side conversations can be some of the best learning moments. This is a good source of finding other Twitter users who you might want to follow or pursue developing a professional relationship. Favorite: One of the more important things I like doing during the chat is clicking on the Favorite star button. Favorites are a way of not only saving your favorite Tweets so you can act on them later, but it shows someone that you liked what they had to say. ReTweeting (RT) someone during the chat is the highest compliment you can give someone. Also it allows your followers to share in your discovery. Block someone or report them for SPAM (some of the bigger chats will have a ton of SPAM at the end- don’t click any links where someone in a bikini tells you they found something funny on the internet this is generally good advice anyways. If the SPAM gets bad the moderators might even change the #hashtag during the chat. If they do this you will need to add a new column in your TweetDeck and drag it back up to the top to replace the old chat column they are abandoning. You can also email the Tweet to your fellow teachers/edu leaders who aren’t on Twitter yet- cool. But why email the Tweet when you can just get your friends on Twitter? * Bonus tip from @AliceKeeler (aka WonderNerd) create two #chat columns for the chat you are following. One you keep scrolling to show what’s happening in real time and one that allows you to lag behind as you are reading the comments and responding to them. Thanks Alice! (she shared this during tonight’s #CAedchat which take place on Sundays at 8PM PST. I just recently learned a new trick that is SUPER useful. If the chat has only one moderator or the chat is really good about both moderators you can add a colum that contains just ONE user (the moderator) and then it will be SO much easier to to find the questions. 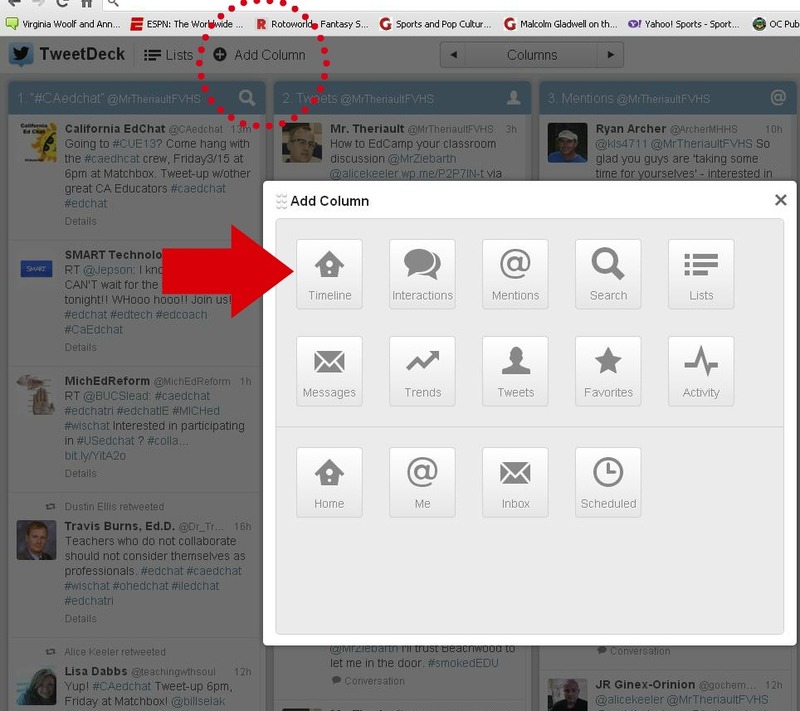 The red arrow is where you click to add and follow just ONE user to a column in Tweet Deck. BUT EVEN BETTER than the “USER” add is the “LIST” add. Go back up one pick and look at that GREEN arrow. You can create a list ahead of time or if you know the names of all the #CAedchat mods you can put them in one list. I’ve made it easy for you. Here is the list of #CAedchat moderators. You can even create the list inside of TweetDeck. Here is a picture. 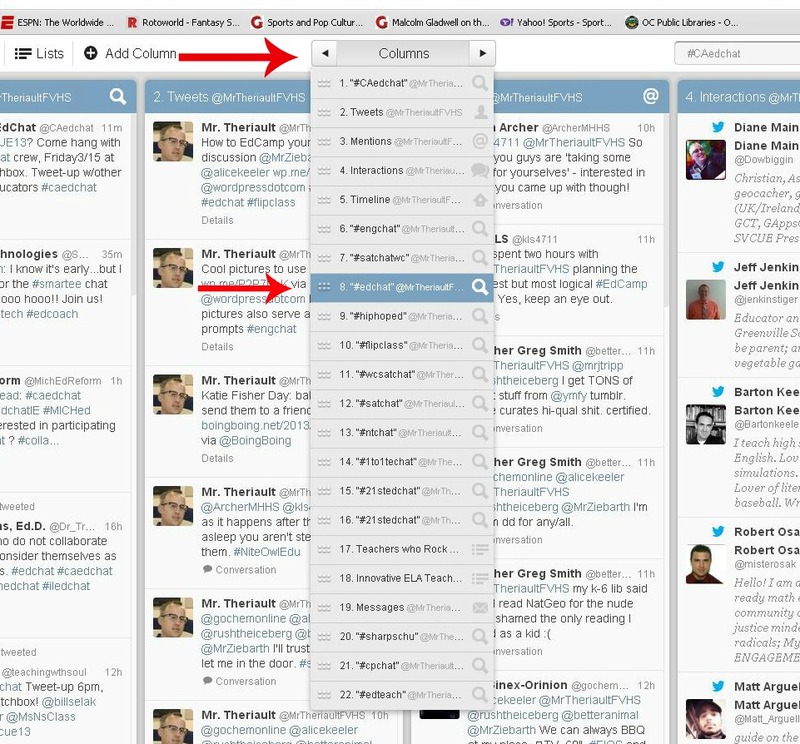 Once you click “Add column” it will look like this in TweetDeck- click on the picture for a larger view. How awesome is that. How easy will it be to find the questions NOW?! Of course you can do more than just follow moderators. You could create other lists, friends, local PLN that you invited to the chat and use the column to keep track of them during the chat. It’s SO DARN SWEET. UPDATE 1/12/14 HOW TO GET RID OF SPAM! So today we did a huge fast #CAedchat and it was CRAZY. It was trending OVER the Golden Globes. 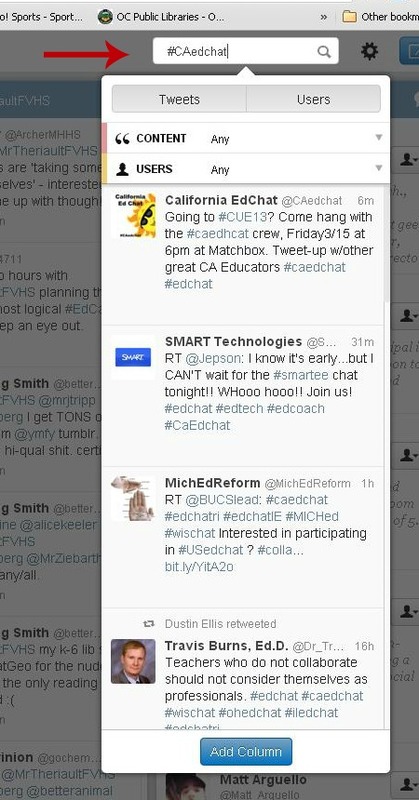 That means there were more people tweeting about #CAedchat than tweeting about the Golden Globes. Click on that weird slider looking icon and it will open the tools for the column. Then click on “Content” and you can exclude any word you want. Then click on the slider bar to close the settings panel and continue chatting. It should take less than a minute. Honestly. You can thank me by giving me a hug when you see me, or a high five- I don’t want to make you feel uncomfortable and all. First there should be a Tweet that will tell you where to find the archive of the entire chat. The archive is nice because you can take your time and scroll through each of the Tweets at your leisure. You won’t have the interactivity, but you will be able to see what you missed as you replied and RTed during the chat. Plus you will have the memories of a great time forever. You can but you just need to be aware that it’s insanely difficult to follow and you need to temper your expectations accordingly. *My principal wanted to know how to join and participate in a Twitter chat and he and I are a little busy right now so I made him this post- he and I are big hockey fans although I hate his favorite team since they were stolen from Canada. Hopefully this post will help someone you know get the most out of their Twitter Chat experience. Great post David!!!! I hear a lot about TweetChat as well. Might be another tool to try out! This helps so much! I’m a novice Tweeter, so this will help me get a better hold on participating in chats. I always wondered how people kept up. Now I’ve got a tool to try next week for #engchat. Finally! Thank you! Thanks Karen I appreciate your comment. When I get a chance I’m going to update this post with a few other tools to help out during Twitter chats. I love the fact that you love hockey! How do you get to see Coach’s Corner in California? 1. Watch it when I’m visiting relatives in Canada. 3. Read about recaps of the show. Great and comprehensive post by @davidtedu on Twitter Chats. Thank you for this! I am in the midst of teaching Twitter noobs the ends and outs of chat and was going to write something up for them, but your analogy is better than mine, so I’ll be stealing this tyvm! New to twitter. 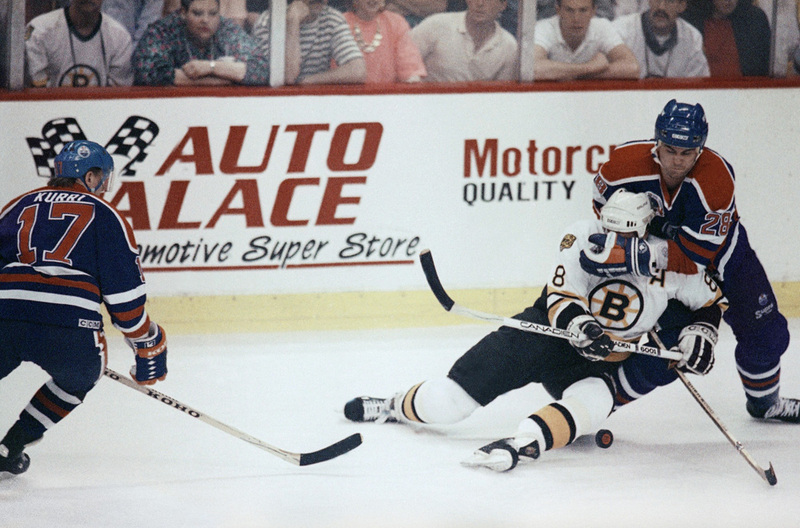 Did chat Thurs and felt like the puck in that game. Things much clearer after reading your article. Thx. Thanks for this, the anti-spam tip was especially helpful, I’ve been mashing the “block” button the but your “exclude” trick is pretty nifty.